Pumpkin spice lattes are apparently very tasty. Unfortunately, I’ve never had one because they flavoring typically contains dairy. Luckily, I found this recipe to make it at home! The recipe calls for coffee or espresso however, you could try it with a black tea if you prefer. If you’re avoiding caffeine, try it with a roasted dandelion infusion! 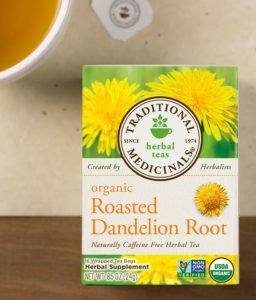 Traditional Medicinals makes a roasted dandelion tea and . 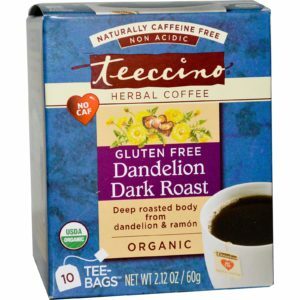 . .
Teeccino makes a Dandelion Dark Roast that many people use in place of coffee due to the similar, dark roasted flavor. Prepare the coffee or espresso. Heat the coconut milk in a small pot or a tea kettle. Add the warmed milk and remaining ingredients to a blender and blend until well combined. 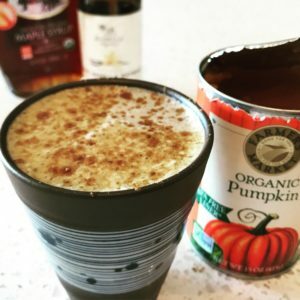 Pour into a mug and sprinkle extra pumpkin pie spice if desired. Serve and enjoy.